After paying him in three dollars bills, Mr Limp Bizkit, Fred Durst was willing to share with me some inspirational quotes via his twitter account to help guide us though life. As you can see Fred doesn't look so nearly angry as he used to be so some of his counsel is pretty mellow! 1. "Take a serious moment for yourself and truly focus on something that can make your life, and those around you, more rewarding and positive." 2. "We all have our problems and faults, but we also have our hope and faith. I find myself actually becoming whole and that inspires life." Fred says to make yourself whole and that's that. 3. "Life is what you make it." This is nearly as good as life is like a box of chocolates. It's life affirming because with Fred Durst you never know what you're gonna get. 4. "I truly believe you can change for the better if you believe that you can. " Cher believes in lots of things too Mr Durst. 5. "Tomorrow is yours. Own it!" But if everyone owned the day, we'd all own like 1 / 7000000000000000000000th of it. 6. "And may the bed bugs shrivel and die before they make it in your sheets to eat you alive"
I'm actually with this Fred's quote on this one. I wish the bugs would all die! 7. "Logic is my tool of choice for a quick fix." I know I've stolen this one from its proper context but on its own it does make sense. Not using logic is illogical according to Spock. 8. 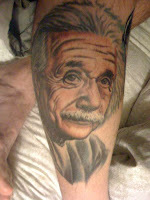 "my favorite tattoo is my Albert Einstein on my leg"
9. "The FUTURE is easy because it doesn't exist. The PAST is painful because it is forever." It's accurate but its almost the inverse of an inspirational quote. Fred makes excellent use of CAPITALS to make the quote even more ACCURATE. 10. ""Whoever undertakes to set himself up as a judge of Truth and Knowledge is shipwrecked by the laughter of the gods." Fred borrowed this one from his main main Albert. I'll leave you to ponder it, but I'm pretty sure I read in Dawkins that Einstein was an athiest (despite popular belief to the contrary).